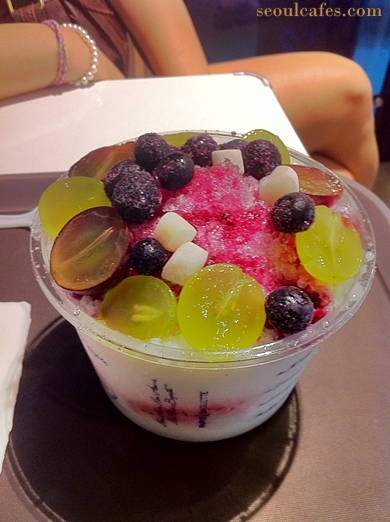 A "lighter" version of a bingsu from Paris Baguette. Most bingu and the more famous ones are "fancy" and "heavier" with many toppings on top, this one is simpler with frozen blue berries and giant seedless grapes as the main toppings. Just a few years ago, many bakeries like Paris Baguette have been turning their "bakery" into "cafes" with tables and seats and of course drinks! Their coffee drinks are pretty decent and it really depends on who makes it/what store you go to. Some will have great coffee and some will taste like water. I've had both from PB before. Same goes with their baked goods. Some store will have the best stuff while some will taste like they've been sitting there for a few days.. So if you happen to have a bad experience with them, don't be discouraged~^^ not are all the same.